A 19‐year‐old African American man was “not acting right,” so he was brought to the emergency room (ER) by his mother. Last year, he was treated for syphilis and diagnosed with HIV but did not seek further medical care. His review of systems only noted a recent upper respiratory tract infection. A head CT was unremarkable. He was given antibiotics for a tooth abscess and sent home. The confusion worsened over 3 weeks, so the patient returned to the ER. On exam, he was alert, disoriented with slurred speech, and followed simple commands with marked latency and psychomotor slowing. Cranial nerves and sensation were intact. He had diminished extremity strength, poor coordination, and an unsteady gait. The remaining exam found diffuse lymphadenopathy. A complete blood count, metabolic panel, urinalysis, and chest x‐ray were unremarkable. 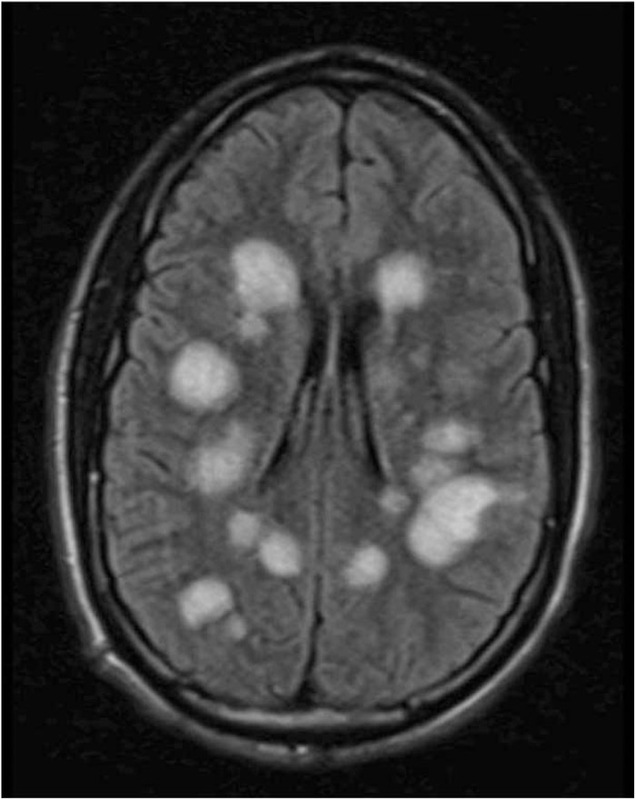 A brain MRI showed multiple well‐defined hyperintense lesions (Fig. 1). A lumbar puncture revealed normal opening pressure and unremarkable cere‐brospinal fluid (CSF) analysis. Further CSF analysis did not detect cytomegalovirus, Epstein–Barr virus, herpes simplex virus, varicella zoster virus, VDRL, tuberculosis, JC virus, tox‐oplasmosis, or Cryptococcus. All cultures remained sterile. Serum toxoplasmosis antibodies were negative. CD4 was 306 cells/μL. Antiretroviral therapy for HIV was initiated. The patient developed lethargy, paraplegia, severe myoclonic jerks, and seizures requiring intensive care unit transfer and mechanical ventilation. Brain biopsy revealed a diffuse demyelinating process. He was diagnosed with acute disseminated encephalomyelitis (ADEM) and treated with high‐dose steroids and intravenous immunoglobulin (IVIG). After a long hospitalization followed by 3 months of rehabilitation, the patient has minimal neurological sequelae and plans to attend school. ADEM is an immune‐mediated inflammatory disease with a rapidly progressive clinical course often triggered by a preceding infection or vaccination. It is a monophasic disorder characterized by acute encephalopathy and multifocal neurological deficits from widespread demyelination predominantly affecting white matter. Case series reports support treatment with high‐dose steroids and IVIG, with 70%–90% of patients achieving a full recovery. ADEM is more common in young children and must be distinguished from multiple sclerosis. The pathogenesis remains unclear, but an autoimmune response to an infectious agent probably contributes to demyelination through increased reactivity of T cells cross‐reacting with myelin protein. Only a few case reports of ADEM in HIV‐positive patients are documented. For immunocompromised patients, ADEM can be challenging to identify amidst a broad differential diagnosis. Nevertheless, the rapid development of neurologic dysfunction with multifocal lesions on brain MRI should alert physicians to this disease. Wise K, Kobaidze K. A Confusing Case of Confusion. Abstract published at Hospital Medicine 2011, May 10-13, Dallas, Texas. Abstract 431. Journal of Hospital Medicine. 2011; 6 (suppl 2). https://www.shmabstracts.com/abstract/a-confusing-case-of-confusion/. Accessed April 22, 2019.